Yesterday in the new issue of Writer’s Digest, I read a little article about how to market yourself successfully as a writer. One of the things the author said was that a writer had to avoid being narcissistic when blogging, that readers don’t always enjoy reading about a writer’s life or seeing a writer focus entirely on herself. On a most fundamental level, I agree; most of us get really annoyed with people – friends, writers, celebrities – who can only talk about themselves. We feel drained when in relationships, real or virtual, with people who are always asking us to send our energy to them without any of their energy returning to us. My conundrum comes because I guess I think that blogging – maybe writing in general – is in some ways self-absorbed. It almost has to be because it requires such solitude and attention to self to be successful. If I go out and give all of my ideas and energy away to other people, I don’t have anything left to put on the page; then, I have not lived into what I was made to do. Lest you think I’m advocating selfishness, let me qualify and say that I don’t think people should “look out for number one” or that “it’s all about me.” I don’t think that at all. In fact, when I’m doing my job well, the writing should transform from being about me to being about you, the reader. But the only way I know how to make something about you – since I don’t live in your skin or walk through your days – is to write about me and hope that my words live for you in some way. Of course, I am a nonfiction writer, so perhaps this is different for fiction writers. Do you guys feel you’re putting yourself on the page, or are you creating characters who are “other” than you? I suspect it’s some of both, but I’d love to hear about that. So I’m back to my initial question – is it possible to blog and not be entirely narcissistic? I certainly hope so. I don’t write this sucker for myself; if I did, I’d just fill up journal pages. 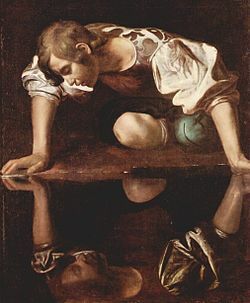 But I do wonder if something of Narcissus doesn’t live in every writer, something of us staring back at ourselves in the hopes of catching a glimpse of the world behind our shoulders or seeing a tiny little Mermaid swimming below the surface beneath our reflections.